The story itself is amazing. 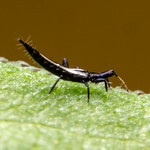 It’s been known for some time that Ichneumonid and Braconid wasps inject circular strands of DNA- called polydnaviruses– into their host insects along with their eggs. 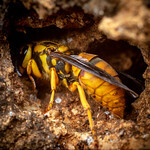 This DNA is encoded by the wasp genome but acts like a virus in their hosts, dismantling the immune system to protect the developing wasp larvae. In a study out this week in Science, a team headed by Jean-Michel Drezen pinpointed the origin of the polydnavirus as being a type of nudivirus. It seems that some ancient wasps co-opted insect viruses, incorporating them into their own chromosomes for use against their hosts, and now many of their descendents have honed the viral trick into a finely-tuned weapon. I photographed this Cotesia congretata wasp ovipositing into a Manduca hornworm last fall, both from lab colonies here at the University of Illinois. The caterpillars really are blue, the manufactured lab diet prevents them from acquiring the green color of wild caterpillars. ***update 2*** This must be an exciting story, because Ed Yong just blogged it. Thanks guys! I’m also enjoying the random incorrect photos that news agencies attach to their articles. Like the one here showing a species of wasp that doesn’t carry the virus.